There is a sensorial communication between the body and place that points to the perceptual construction of the world’s ‘worldliness’ through kinaesis, tactility and proprioception (the body’s sense of balance). The aesthetic of embodied performance (gesture, movement, voice, action) is not only a social synchrony, but a synchrony embedded in a network of object-and-place relations as well as in sedimentations of previous sensory exchanges. This is why materiality is neither stable nor fixed but inherently transitive. This is also why it triggers sensory landscapes through performance. Much like materiality is not fixed, performance is not a re-introduction of a pre-existent code. It is a poesis, the making of something that was previously non-existent or experientially unmarked. But what of dust? Consisting of particles of pollen, human and animal skin, hairs, minerals, soil and burnt meteorites, dust seems like the antithesis of the performative-material nexus. Dust imposes a hiatus, a pause, a blurriness on the material world. Closely related to distanciation and neglect, it does not fall on the world’s surfaces alone; dust falls on the senses, too. Although dust can, of course, be seen as a perceptual stance that negates the world’s vibrant wordliness, this paper argues to the contrary. 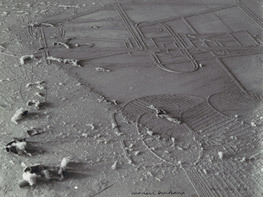 Borrowing Cixous’s écriture blanche, I argue that dust is not the ‘numbing’ of memory but a material practice activated by embodied acts and semantically dense places. As such, dust does not diffuse memory but, instead, places the world under erasure. In erasure, the ‘object-ness’ of the object, the ‘place-ness’ of place become present through being absent or redundant; conversely, they become absent or redundant through being present. This means that the performative-material nexus can be thought in the negative, much like nostalgiacreates a past that never existed by amplifying its non-existence in the present.